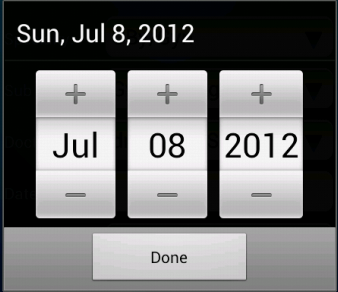 My application was working perfectly on my Android 2.2 emulator. I then decided to test on an Android 4.1 emulator. The DatePickerDialog looks a little different and for some reason when I press on "Done", the onDateSet() listener gets called twice and causes problems in my application. I know this because the log shown below in the code is printed twice whenever I click on "Done"
This double fire issue also happens with onTimeSet of a TimePickerDialog and this check also works for those. To reiterate: This is a confirmed bug in Android. Two workarounds have already been suggested, saving the state in a (instance) variable or asking the Dialog if it isShown(). But isShown() seems to be unreliable (according to this answer's comments for example) and saving the state gets messy if you want to re-show the dialog. Not the answer you're looking for? 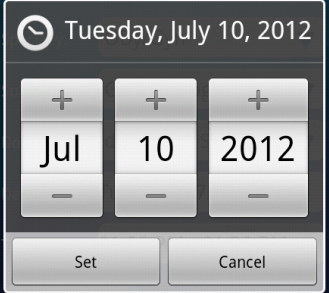 Browse other questions tagged android datepicker emulation android-4.2-jelly-bean or ask your own question.